I haven’t officially researched this, but it seems to me that in the last 20 years, Americans have become much more interested in decorating their homes for Halloween. Have you noticed this trend? Decked out homes lead us down a path of coffins and gravestones, eery music pumps out of hidden CD players, and scary artifacts like mummies are around each corner. Other homes take the friendlier Halloween route and offer happy-looking witches, mysterious stews made interesting via the use of dry ice, and elaborately cut jack-o-lanterns with happy faces. My point is that decorating for Halloween is a growing trend. Are you keeping up? If you’re holding an October fundraising auction, it would be a shame not to jump on that trend and offer a few items to appeal to the crowd. As professional services typically don’t produce strong benefit auction revenues, here are some ways to tweak donations to become more appealing to your guests. Instead of selling a standard two-hour consultation from a professional decorator, ask if she’ll spend two hours decorating (or giving ideas to decorate) the front porch for Halloween. If she does nice work, the buyer might pay for her to finish the entire house. When the outdoor lighting contractor offers to make a donation, see if he will tailor his expertise (or at least make it a secondary offer) to creating an intriguing Halloween exterior. Imagine your description: “How $150 in the latest lighting products can be used to make your home the spookiest house for trick-or-treaters.” It sounds compelling for those creative Dads. Ask the professional organizer if she will switch her 3-hour “Getting Started” package to be focused on one task, such as organizing a family’s Halloween decorations in the garage. Organizing decorations seems to be a constant project at many homes. Surely our professional has some ideas on how to keep the breakables from breaking and still keep our decorations to only three plastic bins. Ask the artist if he’ll rough sketch the home of the buyer on a pumpkin (or perhaps the face of a pet). 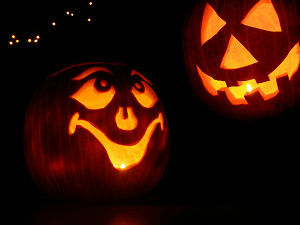 Then the buyer can then carve the pumpkin, and his own home will be gleaming via a candle. Many artists could likely provide a sketch of your home, but this offers a twist on the donation. What else can you come up with? Leave your ideas below. Like what you just read? If so, you’ll love my complementary e-zine, Benefit Auction Ideas. Enroll here to have great auction ideas delivered to your in-box, twice a month.